Earlier today, our CEO Matt Beckham participated in a panel at the CREC Annual Forecast Conference in Oklahoma City. CREC is The Commercial Real Estate Council of Oklahoma City whose membership is comprised of over 300 professional men and women with a common interest in the integrity and success of the commercial real estate industry. The theme of this year’s CREC event was OKLAHOMEGROWN: Sowing the Seeds of Success, and focused primarily on local initiatives and success stories that have generated national attention for Oklahoma city. 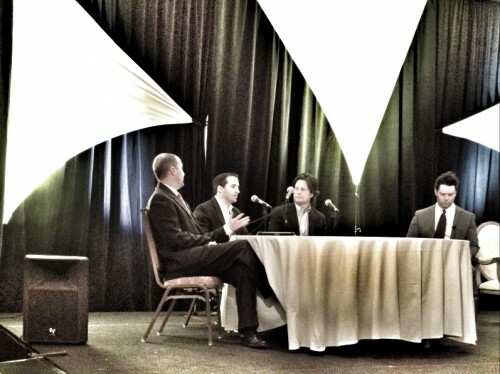 QuiBids’ CEO Matt Beckham participated in a roundtable discussion alongside J.D. Strong, Executive Director of Oklahoma Water Resources Board, and Keith Paul, Founder of A Good Egg Dining Group. The panel fielded questions from a moderator to discuss what about Oklahoma City contributes to the success of their respective organizations, why they decided to locate here, what competitive advantages Oklahoma City has in terms of labor pool, etc. Other Keynote speakers at the event were Brendan Moynihan, editor at large at Bloomberg, and author of What I learned Losing a Million Dollars, and Chris Gardner, inspiration behind the book and the film Pursuit of Happyness.